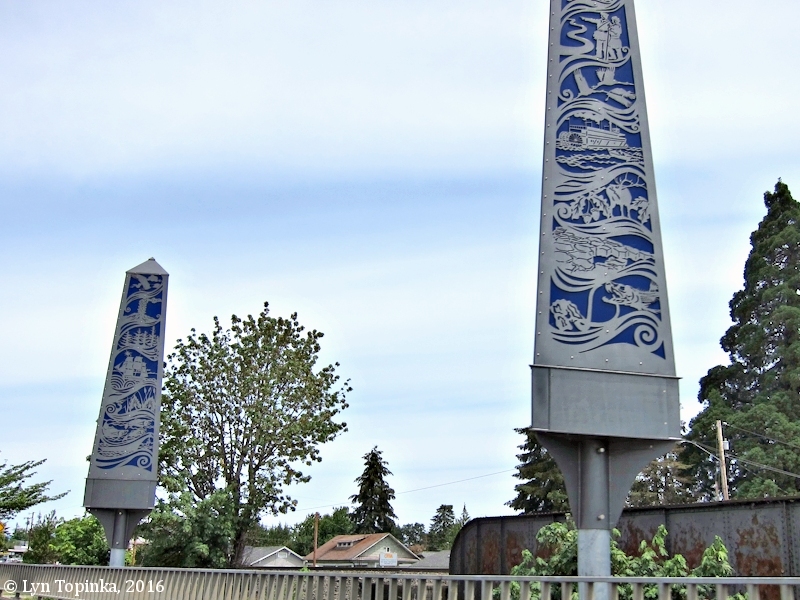 "Milton and Milton Creek (and Houlton), St. Helens, Oregon"
Click image to enlarge Metal Lantern Sculpture, Milton Creek, St. Helens, Oregon. View from moving car heading north on Oregon Highway 30. Image taken June 1, 2016. Milton Creek flows through the southern end of the Oregon community of St. Helens, and enters the waters of Scappoose Bay as Scappoose Bay merges into the Multnomah Channel. The now-gone Oregon town of Milton was settled at the mouth of Milton Creek. South of Milton Creek lies McNulty Creek. "Milton Creek: The town of Milton in Columbia County was one of the early rivals of Portland. It was laid out as a town in 1851 and was founded by Capt. Nathaniel Crosby and Thomas H. Smith. It was once swept away by a flood. Crosby and Smith ran advertisements in the Oregonian in 1851 offering to give two lots to each married man and one lot to each single man who would make his home there and build a house. A district school advertisement for the town is in the Oregonian, September 13, 1851. Milton station was established on the new Northern Pacific Railway in 1886. About 1890, efforts were made to secure a post office, and it was necessary to change the name of the community because there was already a post office named Milton in Umatilla County. Milton in Columbia County was accordingly renamed Houlton, but the railroad-station name was not changed until 1908. Houlton post office was near Saint Helens railroad station. The name of Milton is still attached to a creek that flows near the railway station. The name Milton was adopted for the town because of the location nearby of a pioneer sawmill. The original townsite of Milton was near the mouth of Milton Creek and not where Houlton was situated." "Houlton: Houlton post office was situated at Saint Helens railroad station. The main town of Saint Helens is about a mile from the station. Houlton was originally called Milton. The post office was established about 1890, and inasmuch as there was already a post office in Umatilla County by the name of Milton, it was necessary to find a new name for the Columbia County community. B.W. Plummer was the first postmaster, and he recommended the name Houlton, for Houlton, Maine, his former home. The scheme of having post offices with different names serving the same community has never been satisfactory, and it never worked well at Saint Helens. As a result, the name of Houlton office was changed in the summer of 1946 to Saint Helens, Station A." Is situated on the lower branch of the Willamette river, just above its junction with the Columbia. The advantages of its location speak for themselves. All we ask is, for our friends to call and see the place. Source: "Oregon Spectator", June 27, 1850, courtesy Historic Oregon Newspapers Archives, University of Oregon Libraries, 2016. "Milton Oregon is growing rapidly. This year 144 dwelling houses have been built as against 96 in 1888. Eighteen residences, a new bank building and several other business houses are now under course of construction." Source: "The West Shore", December 28, 1889, courtesy Historic Oregon Newspapers Archives, University of Oregon Libraries, 2016. "... MILTON CREEK, 28.5 m., was named for the old town of Milton founded in the late forties at its confluence with Willamette Slough. The Oregon Spectator, in its issue of May 16, 1850, carried the following advertisement: "TOWN OF MILTON is situated on the lower branch of the Willamette River, just above its junction with the Columbia. The advantages of its location speak for themselves. All we ask is for our friends to call and see the place. For particulars apply to Crosby & Smith, Portland and Milton." A few months later the editor of the Spectator wrote: "The town of Milton one mile and a half above St. Helen's is fast improving and may look forward to its future importance ... We are told that the flats or bottom lands which occasionally overflow, are of great extent and produce abundant grass for the grazing of immense flocks and herds, besides offering the opportunity to cut large quantities of hay." A few years later, waters flooded the town and its business was gradually absorbed by nearby St. Helens." Milton and Milton Creek, etc. "On the Willamette and the Columbia, numberless other points strove to become place. ... Below the present site of Portland, on the right bank of the Willamette, was St. Johns, founded by John Johns, whose brick store is still a conspicuous mark on the green slope of this beautiful little spot. At the head of Sauvies' Island was Linnton, a most ambitious point, established as early as 1844 by M.M. McCarver, with the assistance of Peter Burnett, both of whom were brainy and stalwart men, famous in early history. ... Near the mouth of the Willamette Slough was Milton, founded in 1846 by Captain Nathaniel Crosby. On the Oregon shore opposite the lower end of Sauvies' Island where the lower mouth of the Willamette unites with the Columbia was set St. Helens on a natural site of great beauty. It was established about 1845-46 by Captain Knighton and others." Source: Harvey Whitefield Scott, 1890, "History of Portland, Oregon: With Illustrations and Biographical Sketches of Prominent Citizens and Pioneers: D. Mason & Company, Portland. 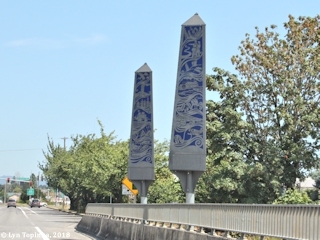 The three-sided obelisks feature designs meant to illustrate the environment and history of St. Helens. Motifs include a sailing ship, a canoe, Mount St. Helens, evergreen trees, and fossils of creatures that once inhabited the area of modern-day Columbia County, such as mastodons and sabertooth salmon. 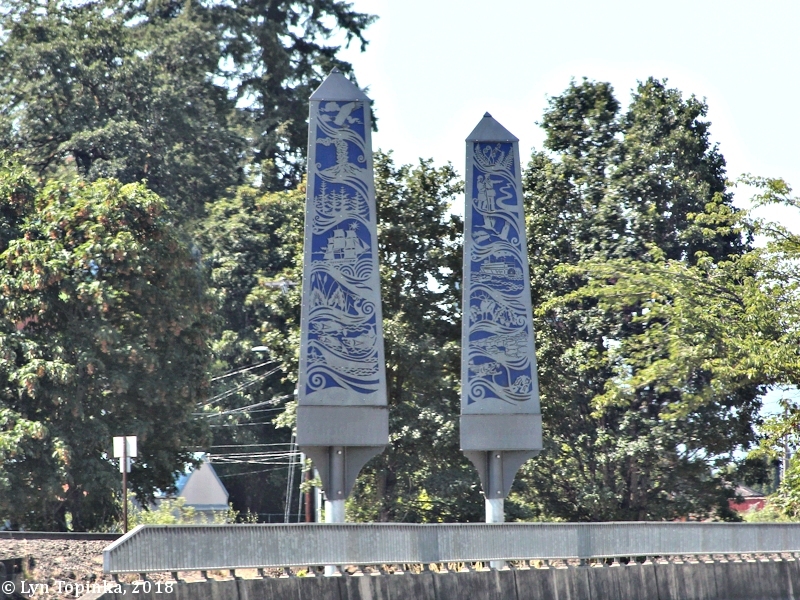 Source: Mark Miller, September 12, 2014, "Ribbon cut for St. Helens sculpture project at bridge", "PamplinMedia.com" website, 2016. 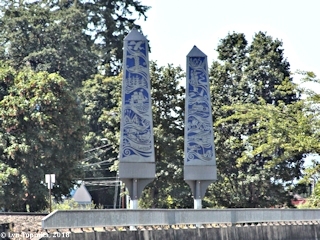 Click image to enlarge Metal Lantern Sculpture, Milton Creek, St. Helens, Oregon. View from moving car heading south. Image taken July 16, 2018. 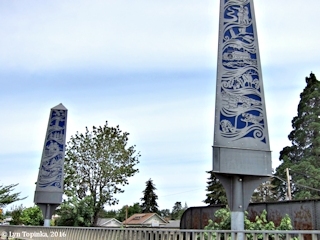 Click image to enlarge Metal Lantern Sculpture, Milton Creek, St. Helens, Oregon. View from moving car heading north. Image taken July 16, 2018.